Create your own collage art based on the incredible works of American artist Romare Bearden (1911-1988). In 1977, Romare Bearden created a series of collages inspired by the ancient poet Homer and his epic story "The Odyssey." Bearden believed that “all of us from the time we begin to think are on an odyssey.” The Romare Bearden collage app, developed by the Smithsonian Institution Traveling Exhibition Service in conjunction with the national traveling exhibition "Romare Bearden: A Black Odyssey," was created with Bearden's quote in mind. With this lively, colorful, and highly engaging app, you can remix works from Bearden's original series to create your own unique works of art, and express your personal journey. Choose from a variety of Bearden’s backdrops and layer in shapes and forms from other collages. Or cut your own shapes, add personal photos, change the colors of various elements and resize them. You can also add your words and your descriptions. Music played a big role in Bearden’s life and his art, so the app also incorporates sound. While you build your collages, you can mash up audio such as ocean waves, jazz riffs, warriors fighting, or even your own voice. An option to record the user's voice is also included and can be played back in a loop as the artwork is being created. Save your visual collages and post them to a public gallery--where they can be tagged and revisited by other users--and share with friends on Facebook, Twitter, or email. You can also learn more about the traveling exhibition, Bearden's life, and the companion exhibition audio tour app. "Romare Bearden: A Black Odyssey," from the Smithsonian Institution Traveling Exhibition Service (SITES), represents the first full-scale presentation of these works outside of New York City. The exhibition will travel to seven cities on a national tour through 2014. 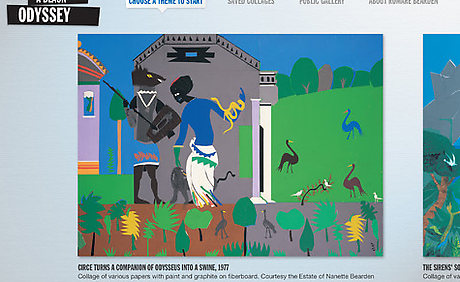 “Romare Bearden: A Black Odyssey” and its related educational resources are supported by a grant from the Stavros Niarchos Foundation.